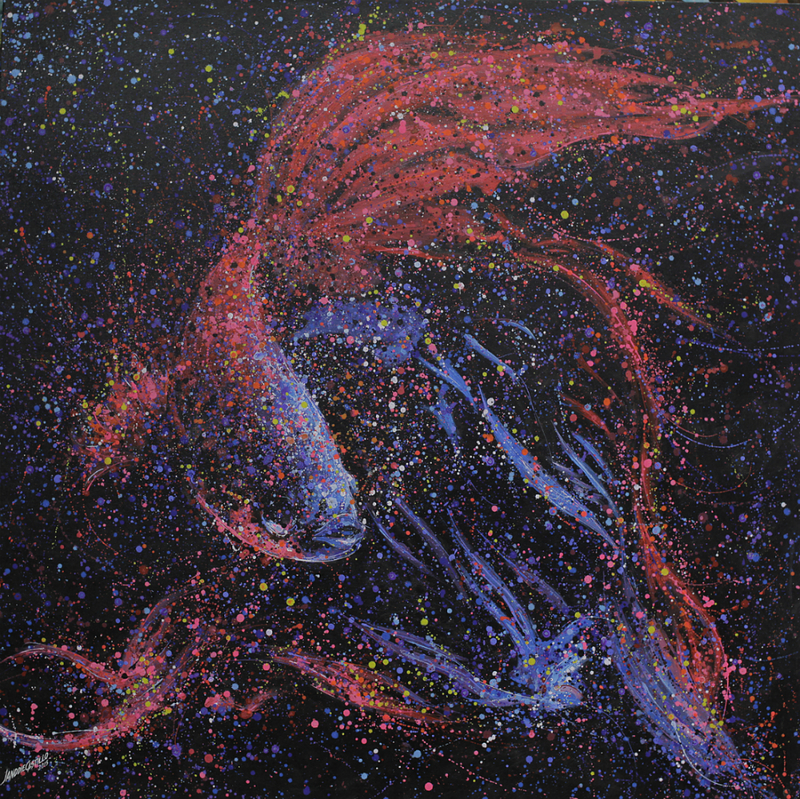 Master of the “Splash Art” is a title given to Janddie Castillo by his peers due to his unique art style which he invented and coined – “Wisikism.” This technique melds realistic, abstraction, expressive and impressionistic themes all in one. Janddie Castillo’s love affair with the arts seems to have been preordained. His father, Nelson Marcelo Castillo, the “Father of Philippine Miniature Paintings” was Janddie’s first teacher and inspiration. While his father was the master of the miniature canvas, Janddie became the master of the miniature stones. Janddie Castillo’s art is a symphony of splashes, splatters and swiping strokes. He has incorporated Jackson Pollock’s “drip technique” and with Voka’s spontaneous realism brush stroke style combined with his chosen colour combinations to make an art style that is truly Filipino. Janddie Castillo is a highly charged Filipino artist. That creates impulsive style of abstract gestural expressive painting. During which the paint is splashed. Spilt or dribbled in a spontaneous improvisatory manner onto a canvas. Janddie Castillo’s action-painting gave complete freedom to the painter’s creative impulses channeling his inner unreflective urge onto the canvas. He artist is more attuned to expressing his emotions and feelings rather than making a picture look realistic. Looking at Janddie Castillo’s paintings, it has the immediacy, vigor and enthusiasm. His simple expression, spontaneous abstractive realism, conveys a defining emotion. And this is exactly the moment where his art begins. Janddie Castillo’s drip method realistic style of painting with its intensely colourful and pulsating subject matter reflects today’s life in its entirety from the hustle and bustle of both cities to the calmness of leisurely times and everyday living. The artist is able to create positive emotions through his paintings a driving element that is almost musical. The basis of Janddie Castillo’s artistic abilities is rooted in his long standing creative challenge with the art of realism and abstraction. His creative process is not the painting of pictures but rather the interaction of colours. Janddie Castillo’s colourful and dynamic “Fighting Fish” painting is a portrayal not only movement and power but also emotion and enthusiasm.